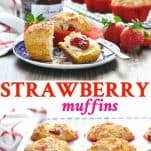 These light and buttery bakery style Strawberry Muffins are an easy make ahead breakfast or snack! 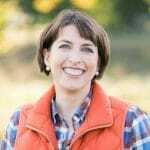 Strawberries are definitely the most popular fruit in our house, and nothing beats the sweetness of a freshly-picked berry from a local farm here in Virginia during the spring months. 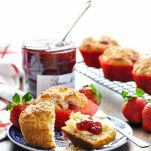 This easy Strawberry Muffins recipe takes advantage of the fresh, ripe fruit for a quick breakfast or snack that the whole family will enjoy! This easy muffins come together in about 10 minutes with just a handful of ingredients that you probably already have in your pantry! 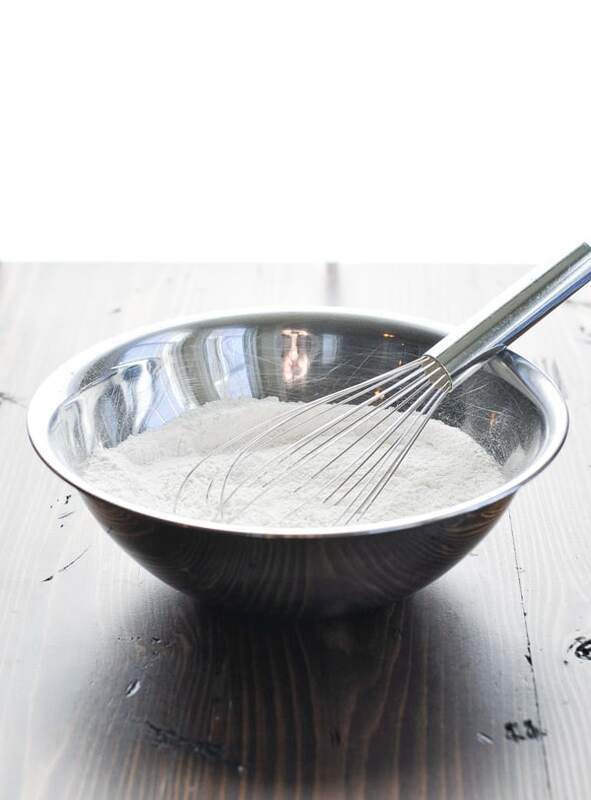 First, whisk together the dry ingredients in a large bowl: flour, sugar, baking powder and salt. 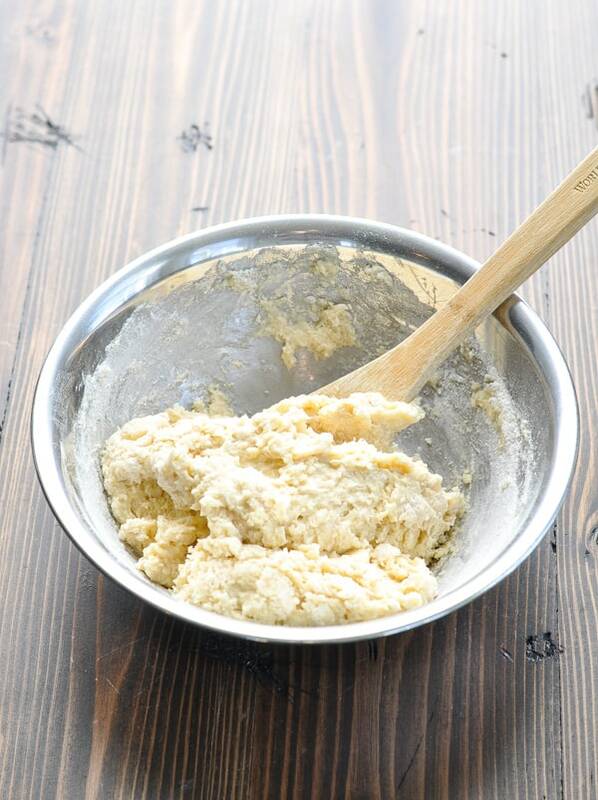 In a separate bowl, whisk together the wet ingredients: egg, milk, melted butter and vanilla extract. 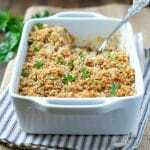 Add the wet ingredients to the dry ingredients and stir just until moistened. Next up: the strawberries! I like to chop the berries into fairly small pieces so that they’re evenly distributed throughout the batter. 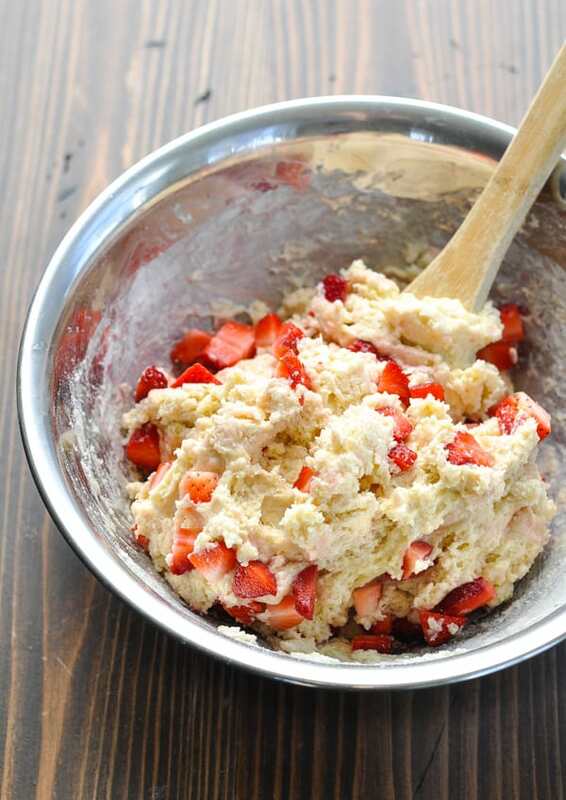 Gently fold the strawberries into the batter. 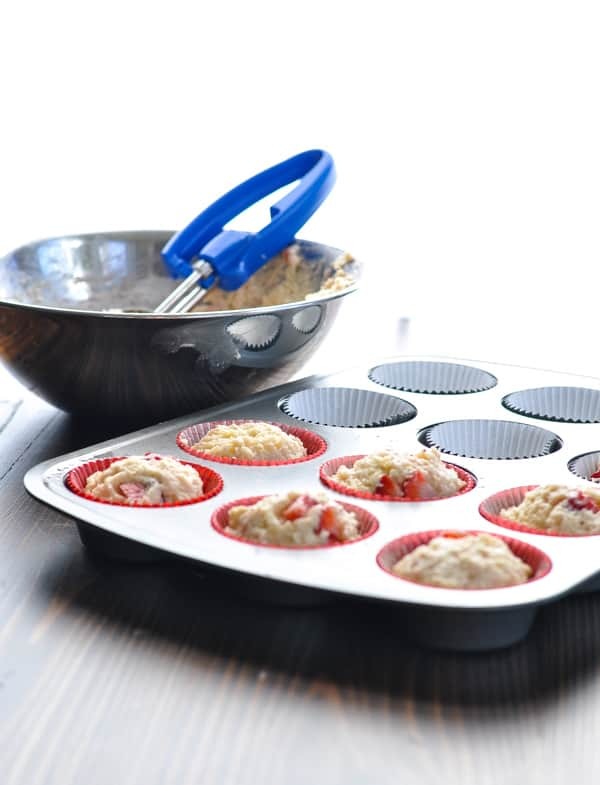 Divide the batter evenly among 12 standard-size muffin cups. I like to use an ice cream scoop to make sure that each muffin is the same size (and therefore bakes in the same amount of time). Finally, the cinnamon-sugar topping! Don’t skip this step, because it adds the perfect sweet, crisp texture to your muffin tops. Plus, you can’t beat the taste! Bake the muffins in 400 degree F oven for about 20 minutes, and then allow them to rest on a wire rack until they’re cool enough to handle. Slather on some butter and devour! To store the muffins, cool completely and then place them in an airtight plastic bag. 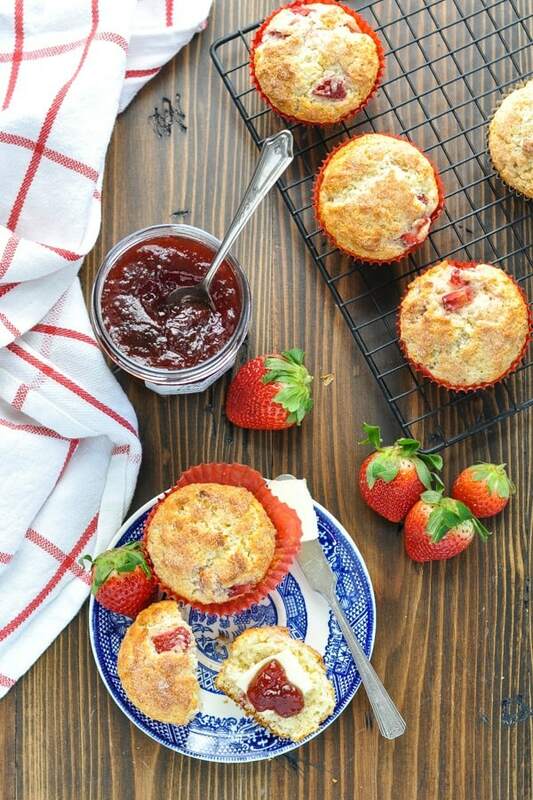 Keep the muffins at room temperature for up to 3 days. 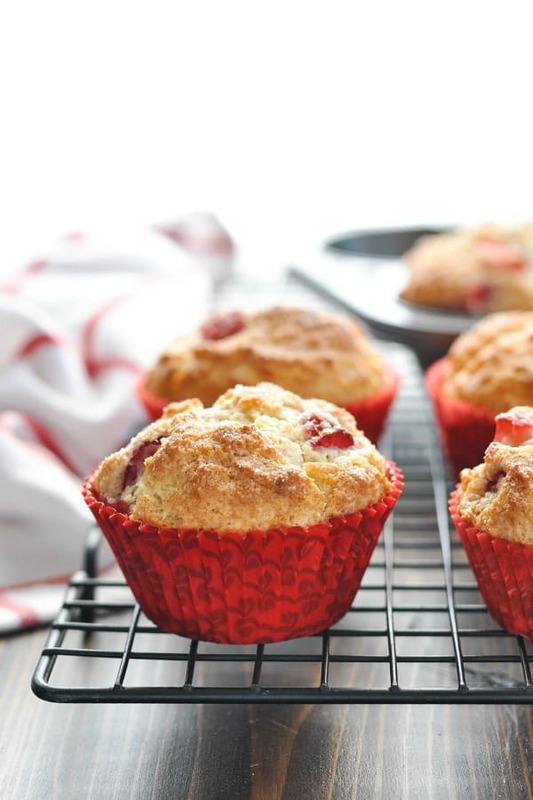 Can you freeze Strawberry Muffins? Yes! 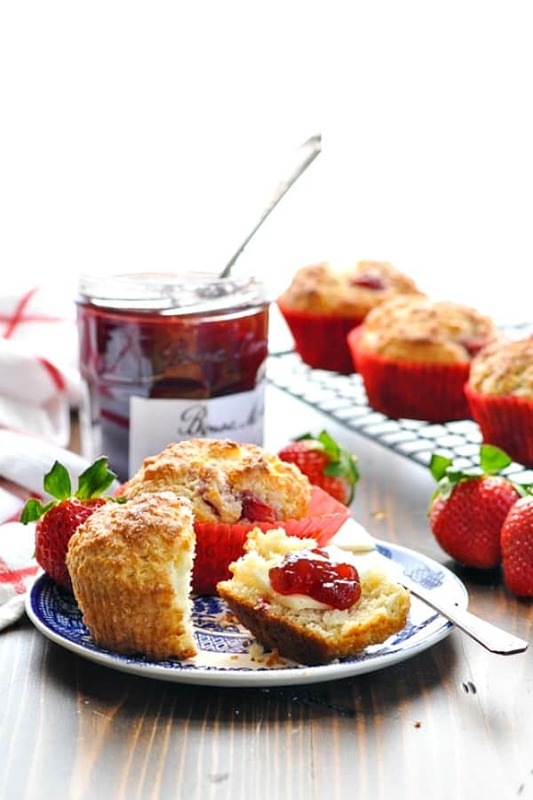 To freeze the muffins, wrap them tightly in foil or place them in freezer bags. They will keep in the freezer for up to 3 months. 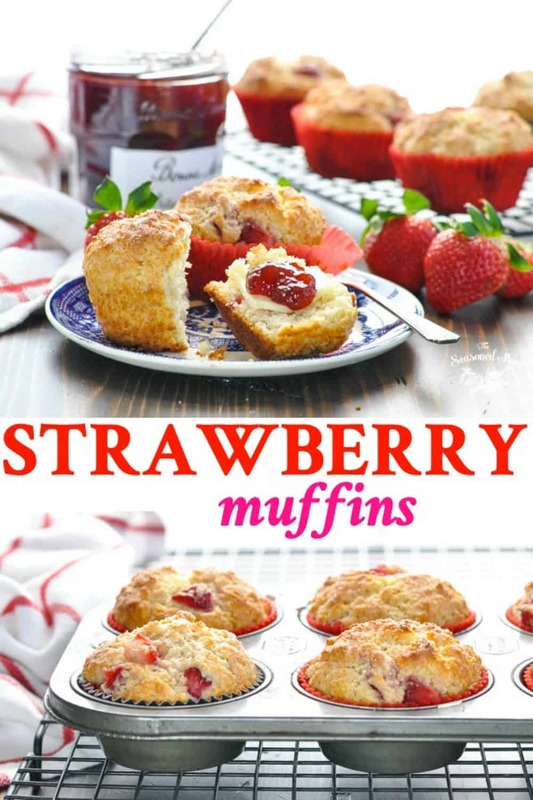 You can use the same batter to prepare a loaf of Strawberry Bread instead of individual muffins. Those instructions are included below. Be careful that you don’t over-mix the batter when combining the ingredients. Otherwise, you’ll end up with tough, dry muffins. 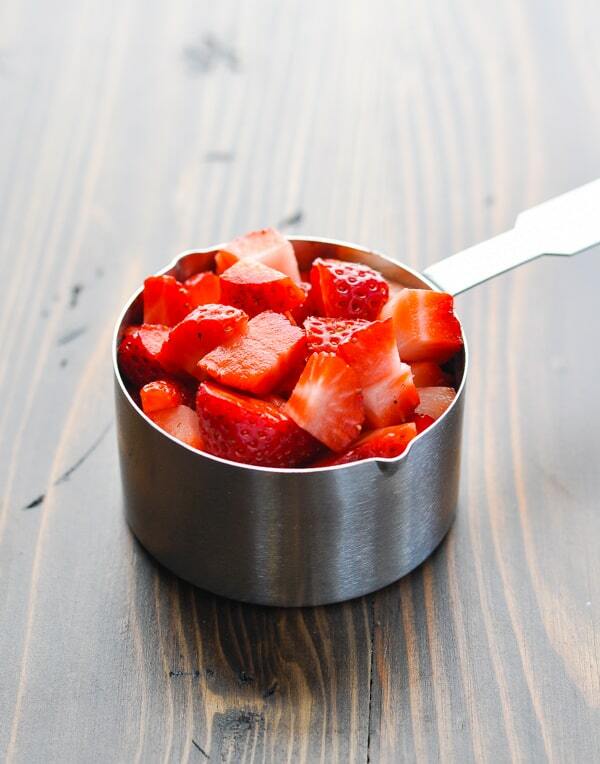 Dice the berries into small, bite-sized pieces so that they’re easily distributed throughout the batter. 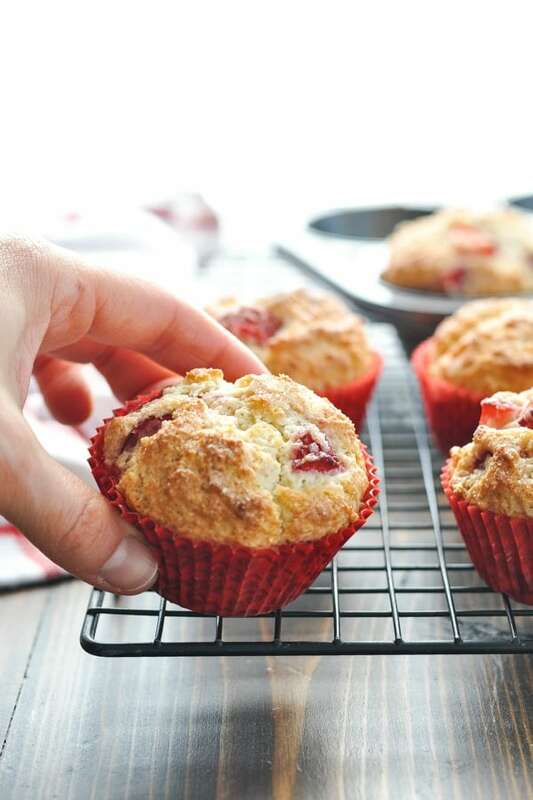 For Whole Wheat Strawberry Muffins, you can substitute half of the all-purpose flour (1 cup) for an equal amount of whole wheat flour. I don’t recommend using 2 full cups of whole wheat flour, because it will make the muffins a bit too dry and dense. 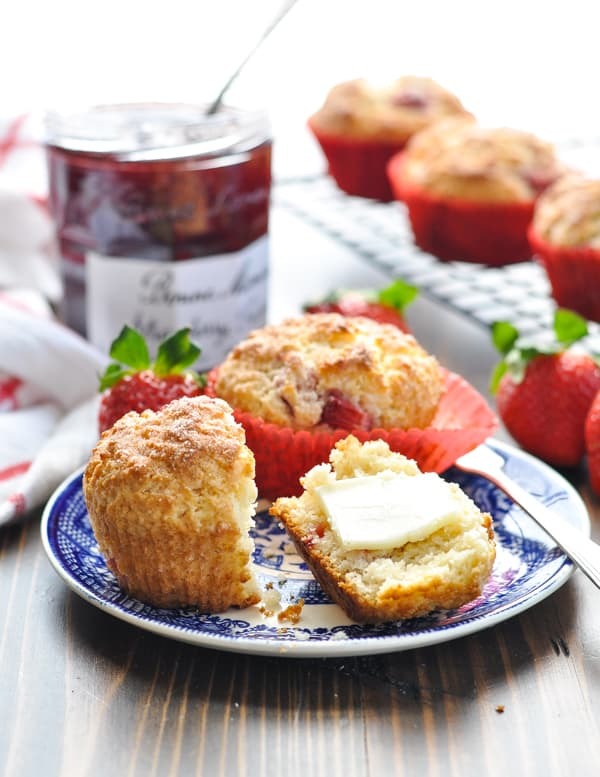 Don’t skip the cinnamon-sugar topping on these muffins! 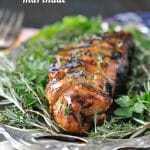 It creates perfect sweet, crispy tops that contrast beautifully with the moist, tender insides. 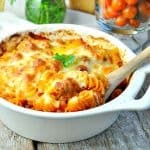 In a large bowl, whisk together flour, sugar, baking powder, and salt. 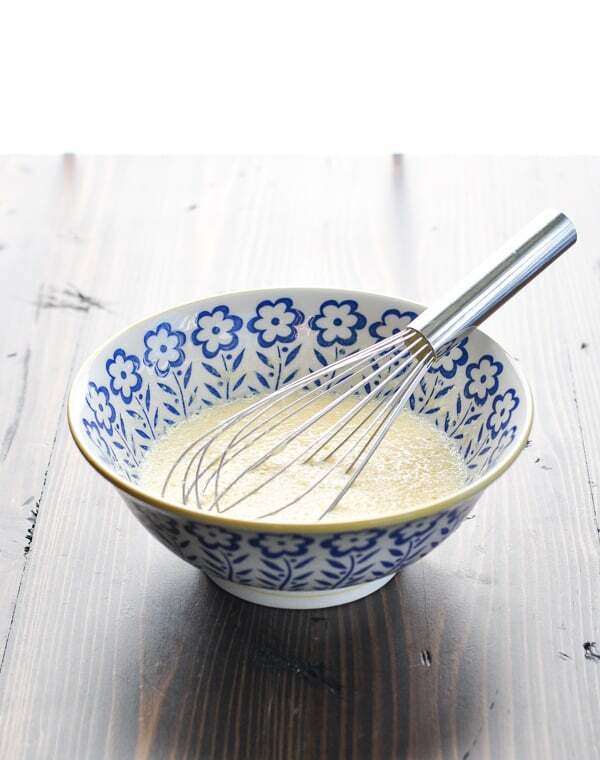 In a separate bowl, whisk together egg, milk, butter and vanilla extract. Add wet ingredients to dry ingredients and stir just until combined (careful not to overmix). For topping, combine sugar and cinnamon in a small bowl. 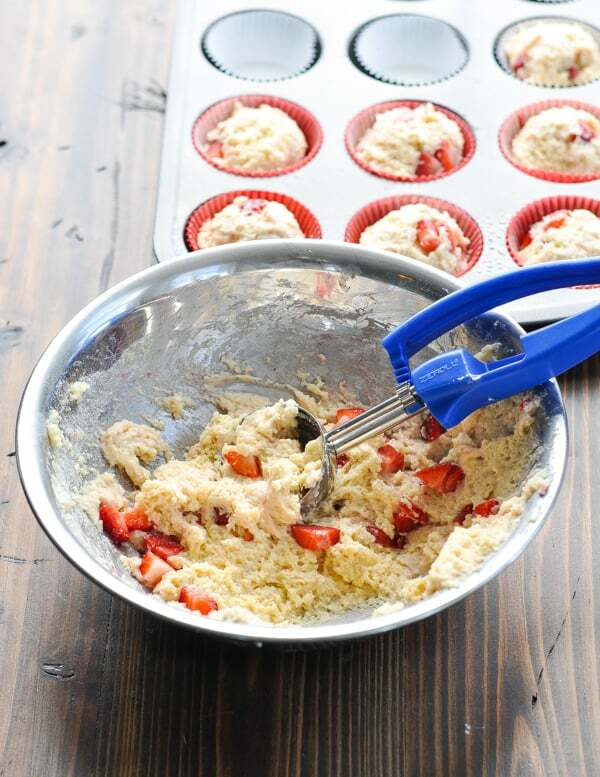 Sprinkle mixture over the batter in the muffin cups. 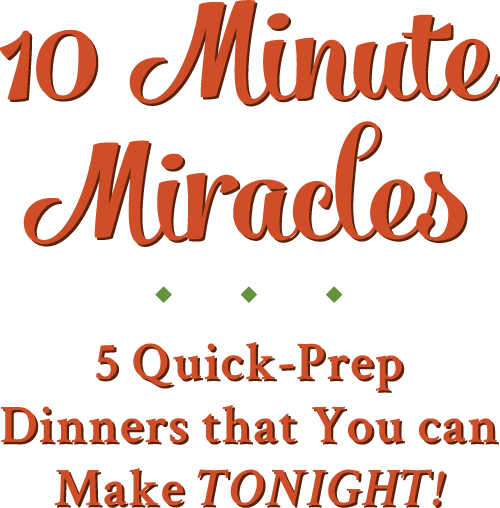 Bake for 18-20 minutes, or until a toothpick inserted in the center of a muffin comes out clean. Spray a large loaf pan with nonstick spray. Set aside. 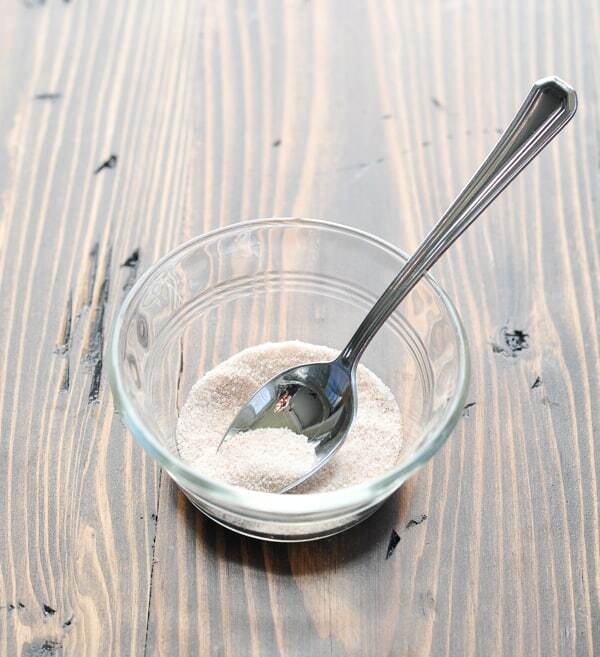 For topping, combine sugar and cinnamon in a small bowl. Sprinkle mixture over the batter. Bake for 45 minutes – 1 hour, or until golden brown and toothpick inserted in center comes out clean. Cool on a wire rack. 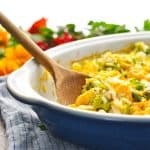 Remove from pan; slice and serve. Can other berries be used such as blackberries? I’m excited to try the recipe! Hi, Marianne! Yes! You can definitely use other berries, but I would chop the blackberries if they’re large so that you don’t have huge chunks of berries throughout the muffin. Smaller berries (like blueberries) are fine to be left whole. Enjoy!